Further protect your My Spiritual Toolkit by creating a Personal Identification Number (PIN) Lock. This brand new feature will help prevent others from accessing your journal entries, inventories and sobriety date. Confidentiality and anonymity are vital components in recovery from alcoholism. A common fear among Alcoholics Anonymous members is that someone will discover they attend AA or read their step work. Adding Pin Lock Protection to your spiritual toolkit will prevent friends, family, employers, co-workers, etc… from accessing your sensitive data or breaking your anonymity. This is especially important if others have access to you phone such as your spouse or kids or if you were to suddenly lose your phone. 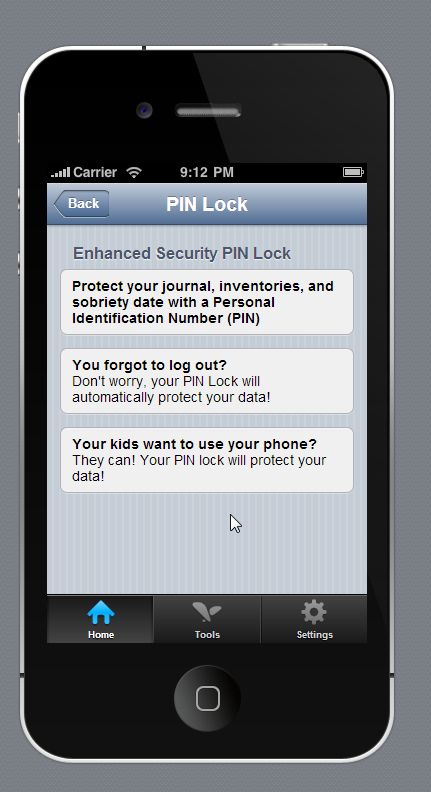 Creating a 4 digit security pin will give you piece of mind knowing that no one will see your step work or journals unless you wand them to. Furthermore, having a PIN enables you to login faster to your account. Instead of having to enter your username (email) and password, just key in the PIN number of your choice for easier, quicker access. Simply exit My Spiritual Toolkit or open another App and your PIN Lock is instantly activated. Will this spiritual tool kit work on my android phone? Yes, it will work on Android phones.